The rockin’ song by Sammy Hagar, I Can’t Drive 55, is still played daily on classic rock channels, but did you know that it has its origins in a Republican fueled idea that lower speed limits will 1) save lives and 2) conserve fuel. It wasn’t Jimmy Carter’s idea for the National Speed Limit of 55, it was the earlier Democrat, Richard Nixon, who imposed that law. For me, and the young readers of my column, a little history is in order. America is great. We were, are and will be the greatest. We build cars that go really fast because we are Americans. We like to go fast. The first Model T’s were reliable and sturdy, but not fast as there were no roads on which to go fast. As roads improved, cars got faster. Muscle cars, performance cars and the family sedan could all fly. My first time doing 120 mph was on I-285 in my mom’s Pontiac Executive. Obviously there weren’t enough cops around back then. It had 440 cubic inch engine with 4 barrels of gas guzzling power. You measured gas mileage by gallons per mile. Along came the third Nanny State president, Richard Nixon, and changed all that. In 1973, partly in response to the ongoing oil crisis, Nixon proposed a 50 mph speed limit for cars and 55 mph for trucks. Congress settled on 55 mph for everybody, down from as high as 90 mph in some Western states. The reduction of speed was supposed to save lives (although 5 mph would have saved more lives) and it was supposed to reduce fuel consumption. A study later showed a .2% (that is 2/10 of 1 percent) fuel savings. Nixon was later caught up in a scandal called Watergate, wherein he tried to stay in power through dirty tricks. After all, for a nanny stater, being in power means the ability to do good things for you sheeple. I digress. Sammy Hagar’s song captured that dissatisfaction with a low speed limit. Sammy had just returned from a three month long safari (life of a rock star is tough) and was driving to his cabin. A cop stopped him and cited him for going 62 mph. The cop said “We give tickets around here for over 60.” Sammy replied, “I can’t drive 55.” And when he got to the cabin, the song was already written in his head, so he put in on paper. Huh, it took me sixteen hours, get to L.A. 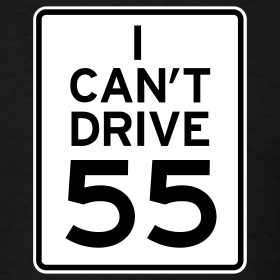 I can’t drive fifty five. And now you know that the inspiration for one of rock’s great songs comes from the Nanny Stater Richard M. Nixon. Make America great again! Previous Window Mystery – Peeping Tom or Lewd Display? Next Poisonous Tree? It Exists.